The chronic difficulty in the supply of military forces in the desert led to several indecisive victories by both sides and long fruitless advances along the coast. The Italian invasion of Egypt by the 10th Army in 1940, advanced 97 km (60 mi) into Egypt and more than 1,600 km (1,000 mi) in a straight line from Tripoli, 600 km (370 mi) from Benghazi and 320 km (200 mi) from Tobruk. The Western Desert Force (WDF) fought a delaying action as it fell back to Mersa Matruh (Matruh), then began Operation Compass, a raid and counter-attack into Libya. The 10th Army was destroyed and the WDF occupied El Agheila, some 970 km (600 mi) from Alexandria. 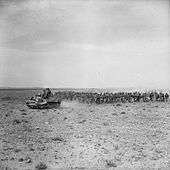 With the arrival of the German Afrika Korps the Axis counter-attacked in Operation Sonnenblume and in April 1941 reached the limit of their supply capacity at the Egyptian border but failed to recapture Tobruk. 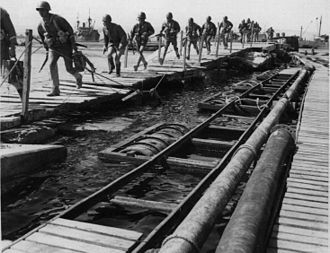 In July 1942, the Allies discussed relatively small-scale amphibious operations to land in northern France during 1942 (Operation Sledgehammer, which was the forerunner of Operation Roundup, the main landings in 1943), but agreed that these operations were impractical and should be deferred. 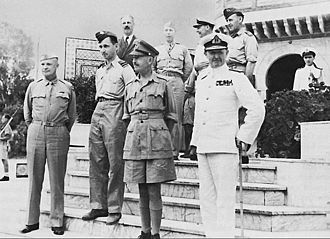 Instead it was agreed that landings would be made to secure the Vichy territories in North Africa (Morocco, Algeria and Tunisia) and then to thrust east to take the Axis forces in the Western Desert in their rear. An Allied occupation of the whole of the North African coast would open the Mediterranean to Allied shipping, releasing the huge capacity required to maintain supplies around the circuitous route via the Cape of Good Hope. On 8 November, Operation Torch landed Allied forces in Algeria (at Oran and Algiers) and Morocco (at Casablanca) with the intention that once Vichy forces in Algeria had capitulated, an advance would be made to Tunis some 800 km (500 mi) to the east. Tunisia is rectangular, with its northern and much of its eastern boundary on the Mediterranean coast. Most of the inland western border with Algeria is astride the eastern line of the Atlas Mountains which run from the Atlantic coast of Morocco, 1,900 kilometres (1,200 mi) east to Tunis. This portion of the border is easily defensible at the small number of passes through the two north–south lines of the mountains. In the south, a second line of lower mountains limit the approaches to a narrow gap, facing Libya to the east, between the Matmata Hills and the coast. 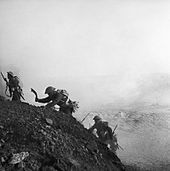 The French had earlier constructed a 20 kilometres (12 mi) wide and 30 kilometres (19 mi) deep series of defensive works known as the Mareth Line along the plain, to defend against an Italian invasion from Libya. The French governor in Tunisia, Admiral Esteva, was afraid to support the Allies or oppose the Axis. He did not close airfields to either side; the Germans moved first and by 9 November, there were reports of 40 German aircraft arriving at Tunis and by 10 November, aerial reconnaissance reported 100 aircraft. Two days later, an airlift began that carried over 15,000 men and 581 long tons (590 t) of supplies and ships brought 176 tanks, 131 artillery pieces, 1,152 vehicles and 13,000 long tons (13,000 t) of supplies. By the end of the month, three German divisions, including the 10th Panzer Division, and two Italian infantry divisions had arrived. Walther Nehring was assigned command of the newly formed XC Corps on 12 November and flew in on 17 November. The French military commander in Tunisia, General Barré, moved troops into the western mountains of Tunisia and formed a defensive line from Tebersouk through Majaz al Bab (Medjez el Bab). There were two roads eastwards into Tunisia from Algeria. 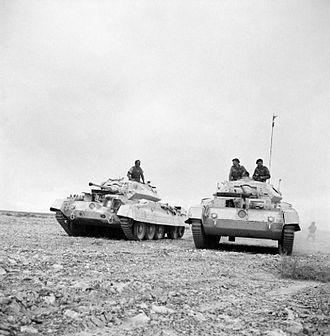 The Allied plan was to advance along the two roads and take Bizerte and Tunis. On 11 November, the British 36th Infantry Brigade had landed unopposed at Bougie but supply shortages delayed their arrival at Djedjelli until 13 November. Bône airfield was occupied following a parachute drop by 3rd Parachute Battalion and this was followed by 6 Commando seizing the port on 12 November. Advanced guards of the 36th Infantry Brigade reached Tebarka on 15 November and Djebel Abiod on 18 November, where they met Axis forces. Further south, on 15 November, a US parachute battalion made an unopposed drop at Youks-les-Bains, capturing the airfield and advanced to take the airfield at Gafsa on 17 November. On 19 November, the German commander, Walter Nehring, demanded passage for his forces across the bridge at Medjez and was refused by Barré. The Germans attacked twice and were repulsed, but the French defensive success was costly, and lacking armour and artillery, the French had to withdraw. Some Vichy French forces, such as Barré's, joined the Allies. 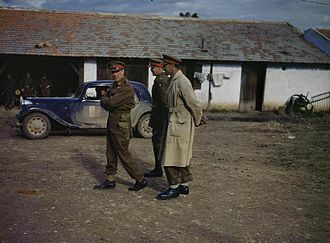 But the attitude of Vichy forces remained uncertain until on 22 November, when the "Darlan Deal" placed French North Africa on the Allied side. This allowed US and British forces that had been securing Algeria to go to the front. 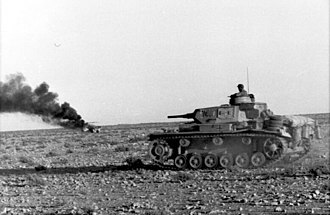 By this time, the Axis had deployed a corps in Tunisia and outnumbered the Allies there in almost all ways. Two Allied brigade groups advanced toward Djebel Abiod and Béja respectively. The Luftwaffe, happy to have local air superiority while Allied planes had to fly from relatively distant bases in Algeria, harassed them all the way. 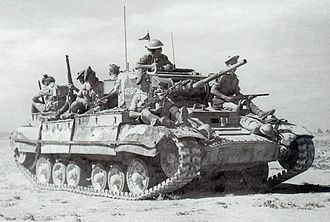 On 17 November, the same day Nehring arrived, the leading elements of the British 36th Brigade on the northern road met a mixed force of 17 tanks and 400 paratroops with self-propelled guns at Djebel Abiod. The German paratroopers, with Luftwaffe and Italian fire support from the 1st Mountain Infantry Division Superga, knocked out 11 tanks but their advance was halted while the fight at Djebel Abiod continued for nine days. 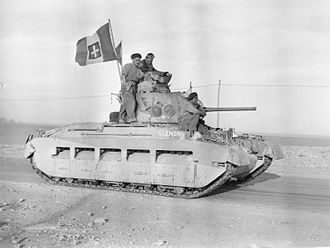 On 22 November, tanks from the Italian 50th Brigade forced US paratroopers to abandon Gafsa. The two Allied columns concentrated at Djebel Abiod and Béja, preparing for an assault on 24 November. The 36th Brigade was to advance from Djebel Abiod toward Mateur and 11th Brigade was to move down the valley of the River Merjerda to take Majaz al Bab (shown on Allied maps as Medjez el Bab or just Medjez) and then to Tebourba, Djedeida and Tunis. 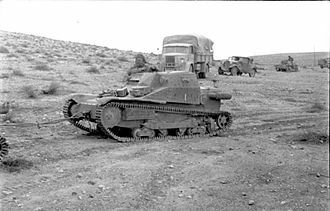 Blade Force, an armoured regimental group was to strike across country on minor roads in the gap between the two infantry brigades towards Sidi Nsir and make flanking attacks on Terbourba and Djedeida. The northern attack did not take place because torrential rain had slowed the build-up. In the south 11th Brigade were halted by stiff resistance at Medjez. Blade Force passed through Sidi Nsir to reach the Chouigui Pass, north of Terbourba part of Blade Force infiltrated behind Axis lines to the newly activated airbase at Djedeida in the afternoon and destroyed more than 20 Axis planes but lacking infantry support, withdrew to Chouigui. Blade Force's attack caught Nehring by surprise and he decided to withdraw from Medjez and strengthen Djedeida, only 30 km (19 mi) from Tunis. The 36th Brigade's delayed attack began on 26 November but they were ambushed with the leading battalion taking 149 casualties. Further attacks were driven back from cleverly planned interlocking defences. 1 Commando landed 23 km (14 mi) west of Bizerta on 30 November to outflank the Jefna position, but failed and rejoined 36th Brigade by 3 December. The position remained in German hands until the last days of fighting in Tunisia the following spring. Early on 26 November, as the Germans withdrew, 11 Brigade were able to enter Medjez unopposed and by late in the day had taken positions in and around Tebourba, which had also been evacuated by the Germans, preparatory to advancing on Djedeida. However, on 27 November the Germans attacked in strength. 11th Brigade tried to regain the initiative in the early hours of 28 November, attacking toward Djedeida airfield with the help of US armour, but failed. On 29 November, Combat Command B of US 1st Armored Division had concentrated forward for an attack in conjunction with Blade Force planned for 2 December. 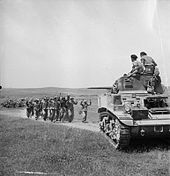 They were forestalled by an Axis counter-attack, led by Major-General Wolfgang Fischer, whose 10th Panzer Division had just arrived in Tunisia. By the evening of 2 December, Blade Force had been withdrawn, leaving 11th Brigade and Combat Command B to deal with the Axis attack. The attack threatened to cut off 11th Brigade and break through into the Allied rear, but desperate fighting over four days delayed the Axis advance and permitted a controlled withdrawal to the high ground on each side of the river west of Terbourba. The Allied force initially withdrew roughly 9.7 km (6 mi) to the high positions of Longstop Hill (Djebel el Ahmera) and Bou Aoukaz on each side of the river. Concern over the vulnerability to flanking attacks prompted a further withdrawal west. By the end of 10 December, Allied units held a defensive line just east of Medjez el Bab. Here, they started a build up for another attack and were ready by late December 1942. The slow build up had brought Allied force levels up to a total of 54,000 British, 73,800 American and 7,000 French troops. 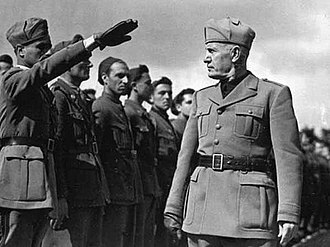 A hasty intelligence review showed about 125,000 combat and 70,000 service troops, mostly Italian, in front of them. The main attack began the afternoon of 22 December. Despite rain and insufficient air cover, progress was made up the lower ridges of the 900-foot (270 m) Longstop Hill that controlled the river corridor from Medjez to Tebourba and thence to Tunis. After three days of to-and-fro fighting, with ammunition running low and Axis forces now holding adjacent high ground, the Longstop position became untenable and the Allies were forced to withdraw to Medjez, and by 26 December 1942 the Allies had withdrawn to the line they had set out from two weeks earlier, having suffered 20,743 casualties. While the battles wound down, factionalism among the French again erupted. On 24 December, François Darlan was assassinated and Henri Giraud succeeded him as High Commissioner. 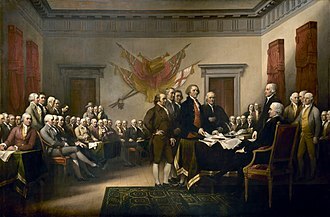 To the frustration of the Free French, the US government had displayed considerable willingness to make a deal with Darlan and the Vichyists. 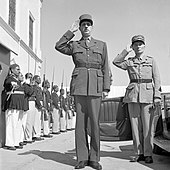 Consequently, Darlan's death appeared to present an opportunity to bring together the French in North Africa and Charles de Gaulle's Free French. De Gaulle and Giraud met in late January but little progress was made in reconciling their differences or the constituencies they represented. 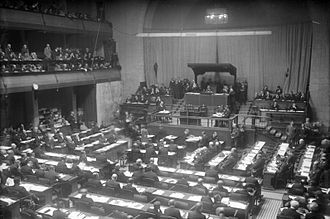 It was not until June 1943 that the French Committee of National Liberation (CFLN) was formed under the joint chairmanship of Giraud and de Gaulle. De Gaulle quickly eclipsed Giraud, who openly disliked political responsibility and more or less willingly from then on deferred to the Leader of the Free French. Nehring, considered by most to be an excellent commander, had continually infuriated his superiors with outspoken critiques. Hed was "replaced" when the command was renamed the 5th Panzer Army and Colonel-General Hans-Jürgen von Arnim arrived in Tunis unannounced on 8 December, to assume command. 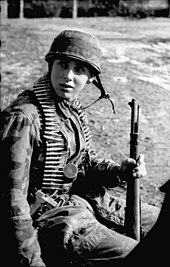 The Army consisted of the composite Infantry Division von Broich/von Manteuffel in the Bizerte area, the 10th Panzer Division in the centre before Tunis and the 1st Mountain Infantry Division Superga on the southern flank, but Hitler had told Arnim that the army would grow to three mechanised and three motorised divisions. The Allies had tried to prevent the Axis build up with substantial air and sea forces but Tunis and Bizerta were only 190 km (120 mi) from the ports and airfields of western Sicily, 290 km (180 mi) from Palermo and 480 km (300 mi) from Naples, making it very difficult to intercept Axis transports which had the benefit of substantial air cover. From mid-November 1942 to January 1943, 243,000 men and 856,000 long tons (870,000 t) of supplies and equipment arrived in Tunisia by sea and air. General Eisenhower transferred further units from Morocco and Algeria eastward into Tunisia. In the north, the British First Army, over the next three months, received three more British divisions, the 1st, 4th, and 46th Infantry Divisions, joining the 6th Armoured and 78th Infantry Divisions. By late March the British IX Corps HQ (Lieutenant-General John Crocker) had arrived to join the British V Corps (Lieutenant-General Charles Allfrey) in commanding the expanded army. On their right flank, the basis of a two-division French XIX Corps (General Alphonse Juin) was assembling. In the south was the US II Corps (Major General Lloyd Fredendall), consisting of the 1st and 34th Infantry Divisions and the 1st Armored Division (although the 34th Division was attached to the British IX Corps to the north). Giraud refused to have the French XIX Corps under the command of the British First Army and so they, along with the US II Corps, remained under command of Allied Force Headquarters (AFHQ). New forward airfields were built to improve air support. 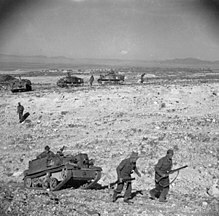 The Americans also began bases in Algeria and Tunisia, to form a large forward base at Maknassy, on the eastern edge of the Atlas Mountains, well placed to cut off the Panzerarmee in the south from Tunis and the Fifth Panzer Army in the north. During the first half of January, Anderson had with mixed results kept constant pressure through limited attacks and reconnaissance in strength. Arnim did the same and on 18 January, launched Unternehmen Eilbote I (Operation Courier I). 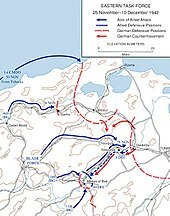 Elements of the 10th Panzer and 334th Infantry divisions attacked from Pont du Fahs to create more space in front of the Superga Division and forestall an Allied thrust east to the coast at Enfidaville, to cut Rommel's line of communication. The westward thrust against the right wing of the British V Corps at Bou Arada had little success but further south his attack against French positions around the "hinge" of the Western and Eastern Dorsals succeeded, advancing 56 km (35 mi) south to Ousseltia and 40 km (25 mi) south-west to Robaa. The poorly equipped defenders resisted well but were overwhelmed and the equivalent of seven infantry battalions were cut off in the mountains. Anderson sent the 36th Brigade to Robaa and requested Lloyd Fredendall to send Combat Command B from 1st Armored Division to Ousseltia, to come under Juin's orders on arrival. 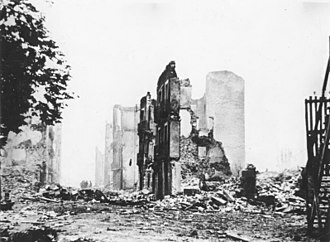 Fierce fighting lasted until 23 January but the front was stabilised. The obvious lack of Allied co-ordination led Eisenhower to change the command structure. On 21 January Anderson was made responsible for the co-ordination of the whole front, and on 24 January his responsibilities were extended to include "the employment of American troops". 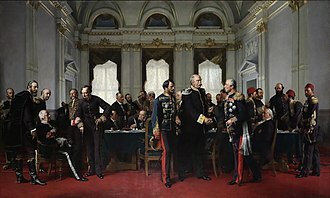 That night, Juin accepted the command of Anderson, confirmed by Giraud the next day but with forces spread over a 320 km (200 mi) front and poor communication (Anderson motored over 1,600 km (1,000 mi) in four days to speak to the corps commanders) the practical difficulties remained. Eisenhower appointed an air support commander, Brigadier General Laurence S. Kuter, for the whole front on 21 January. By 1pm on 21 February, Battlegroup von Broich was in contact with the dug-in 26th Armoured Brigade Group on the Thala road and making slow progress. Rommel took direct control of the attack and forced the defences by 4pm. However, 26th Brigade Group were able to withdraw in reasonable order to the next, final, defensive line in front of Thala. Fighting at this position started at 7pm and continued at close quarters for three hours with neither side able to gain a decisive advantage. Nick Force had taken a heavy beating and did not expect to be able to hold out the next day. However, during the night a further 48 artillery pieces from US 9th Infantry Division arrived after a 1,300 km (800 mi) trip from Morocco on poor roads and in bad weather. 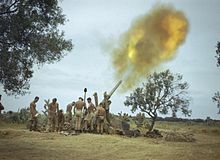 On the morning of 22 February, as Broich prepared to launch his attack, his front was hit by a devastating artillery barrage. Surprisingly, Rommel told Broich to regroup and assume a defensive posture, so surrendering the initiative. The 21st Panzer battlegroup at Sbiba was making no progress. 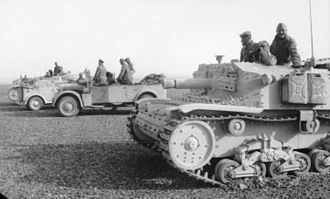 Further south, the Afrika Korps battlegroup on the road to Tébessa had been halted on 21 February by CCB's armour and artillery dug in on the slopes of Djebel Hamra. An attempt to outflank them during the night of 21 February was a costly failure. A further attack early on 23 February was again beaten back. In a dispirited meeting on 22 February with Kesselring, Rommel argued that faced with stiffening defences and the news that the Eighth Army's lead elements had finally reached Medenine, only a few kilometres from the Mareth Line, he should call off the attack and withdraw to support the Mareth defences, hoping that the Kasserine attack had caused enough damage to deter any offensive action from the west. 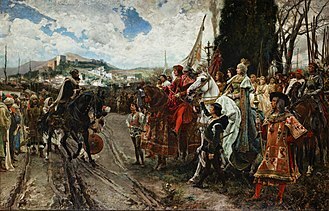 Kesselring was keen for the offensive to continue but finally agreed that evening, and Comando Supremo formally terminated the operation. The Axis forces from Kasserine reached the Mareth line on 25 February. 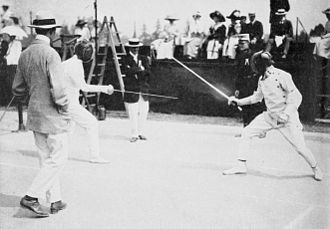 Action then abated for a time and both sides studied the results of recent battles. Rommel remained convinced that US forces posed little threat, while the British and Commonwealth troops were his equal. He held this opinion for far too long, and it would prove very costly. 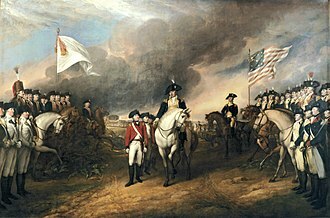 The Americans likewise studied the battle and relieved several senior commanders while issuing several "lessons learned" publications to improve future performance. 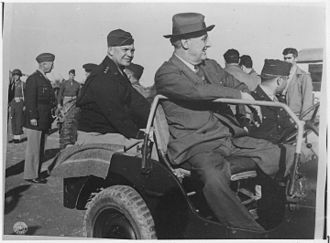 Most important, on 6 March 1943 command of the II US Corps passed from Fredendall to George S. Patton, with Omar Bradley as assistant Corps Commander. 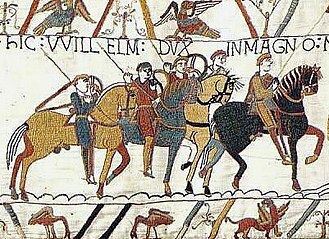 Commanders were reminded that large units should be kept concentrated to ensure mass on the battlefield, rather than widely dispersed as Fredendall had deployed them. This had the intended side effect of improving the fire control of the already-strong US artillery. Close air support had also been weak (although this had been hampered by the generally poor weather conditions). 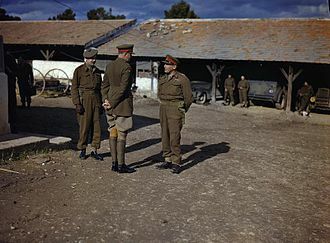 Coningham found that the air organisation in Tunisia was that of the Western Desert in 1941 when he had first assumed command of the Desert Air Force. 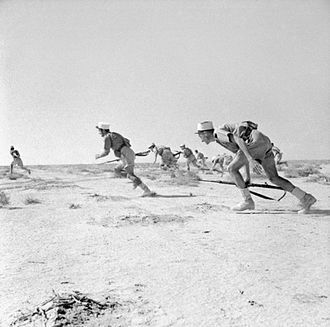 The lessons of the Desert Campaign had not been used in planning for Torch, which constrained the ability of the air arm, already short of aircraft and supplies, to provide tactical support to the army during the Run for Tunis. Coningham unified the British and American operational commands and trained them in new operational practices. The Eighth Army had been consolidating in front of the Mareth defences since 17 February, and launched probes westward on 26 February. On 6 March 1943, three German armoured divisions, two light divisions and nine Italian divisions launched Operation Capri, an attack southward in the direction of Medenine, the northernmost British strong point. The Axis attack was repulsed with massed artillery fire; 55 Axis tanks were knocked out. 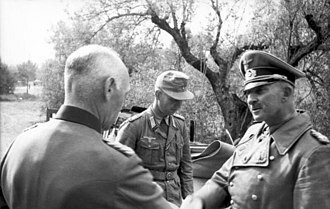 With the failure of Capri, Rommel decided that the only way to save the Axis armies would be to abandon the campaign, and on 9 March he travelled to Italy for discussions with Comando Supremo in Rome. Finding no support for his ideas, he travelled on 10 March to see Hitler at his headquarters in Ukraine, to try to convince him to abandon Tunisia and return the Axis armies to Europe. Hitler refused and Rommel was placed, in strict secrecy, on sick leave. Arnim became commander of Army Group Africa. The reorganised US II Corps advanced from the passes again and got behind the Axis lines; the 10th Panzer Division counter-attacked at the Battle of El Guettar on 23 March. The German tanks rolling up lead units of the US forces ran into a minefield, and US artillery and anti-tank units opened fire. The 10th Panzer Division rapidly lost 30 tanks and retreated out of the minefield. A second attack supported by infantry in the late afternoon was also repulsed, and the 10th Panzer Division retired to Gabès. The US II Corps was unable to exploit the German failure and each attack was stopped by the 10th Panzer Division or 21st Panzer Division counter-attacks up the road from Gabès; co-ordination of Allied air and ground forces remained unsatisfactory. The Eighth Army and the US II Corps attacked for the next week and on 28 March, the Eighth Army captured El Hamma, forcing the Axis to abandon Gabès and retreat north towards the Fifth Panzer Army. The hills in front of the US forces were abandoned, allowing them to join the British forces in Gabès later that day. The 2nd New Zealand Division and 1st Armoured Division pursued the Germans 225 km (140 mi) northwards into defensive positions in the hills west of Enfidaville, which were held until the end of the campaign. Fighting lasted until 5 March and in terrible weather conditions the operation was called off by Arnim. The failure had cost the Axis grievous losses in infantry as well as tanks, particularly the loss of many of the heavy Tiger Tanks. Ochsenkopf was to be the last major Axis offensive by the 5th Panzer Army. On 25 March, Alexander ordered a counter-attack on the V Corps front and on 28 March, Anderson attacked with the 46th Infantry Division, with the 138th Infantry Brigade, 128th Infantry Brigade in reserve and reinforced by the 36th Infantry Brigade, 1st Parachute Brigade and French units including a tabor of specialist mountain Goumiers, the artillery of two divisions plus more from army resources. In four days, it succeeded in recapturing all lost ground and took 850 German and Italian prisoners. On 7 April, Anderson tasked the 78th Infantry Division with clearing the Béja-Medjez road. Supported by artillery and close air support, they methodically advanced 16 km (10 mi) through difficult mountain terrain over the next ten days, clearing a front 16 km (10 mi) wide. The 4th Infantry Division joined the fighting, taking position on the left of the 78th Division and pushing toward Sidi Nsir. 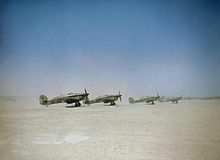 Hawker Hurricanes Mark IID on a Tunisian airfield, preparing for a ground attack mission, April 1943. The Allied forces had reorganised and during the night of 19/20 April, the Eighth Army captured Enfidaville against the Italian 16th Motorised Division Pistoia, which counter-attacked several times over the next three days and was repulsed and the action at Takrouna also took place. The northward advance of Eighth Army had "pinched out" US II Corps' eastward facing front line, allowing the corps to be withdrawn and switched to the northern end of the Allied front. Arnim knew that an Allied offensive was imminent and launched a spoiling attack on the night of 20/21 April, between Medjez and Goubellat on the IX Corps front. The Hermann Göring Division supported by tanks from 10th Panzer Division penetrated up to 5 miles (8.0 km) at some points but could not force a general withdrawal and eventually returned to their lines. 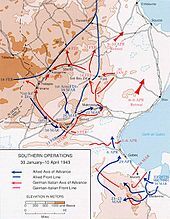 No serious disruption was caused to Allied plans, except that the first attack of the offensive, by IX Corps, was delayed by four hours from 4:00 a.m. on 22 April. 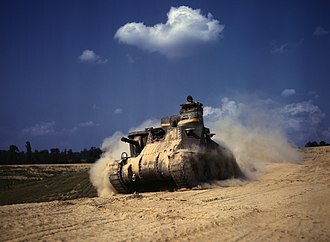 On the morning of 22 April, the 46th Division attacked on the IX Corps front, creating a gap for the 6th Armoured Division to pass through by nightfall, followed by 1st Armoured Division, striking east for the next two days but not quick enough to forestall the creation of a strong anti-tank screen which halted their progress. The battle had drawn the Axis reserves of armour south, away from the central front. Seeing that no further progress was likely, Anderson withdrew the 6th Armoured Division and most of the 46th Infantry Division into army reserve. 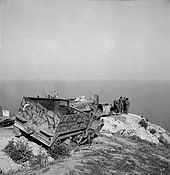 The V Corps attack began on the evening of 22 April and the US II Corps launched their offensive in the early hours of 23 April in the Battle of Hill 609, in which the hill was captured, which opened the way to Bizerte. In grim hand-to hand fighting against the Hermann Göring Division, 334th Infantry and 15th Panzer Divisions, it took V Corps with the 1st, 4th and 78th Infantry Divisions, supported by army tanks and heavy artillery concentrations, eight days to penetrate 9.7 km (6 mi) and capture most of the Axis defensive positions. The fighting was mutually costly but in the Battle of Longstop Hill, Longstop was captured, which opened the way to Tunis and Anderson felt a breakthrough was imminent. 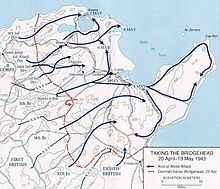 On 30 April, after a failed attempt by the 169th Infantry Brigade of the recently arrived 56th (London) Infantry Division, which had just arrived over 3,300 miles from Syria, it had become clear to both Montgomery and Alexander that an Eighth Army attack north from Enfidaville, into strongly-held and difficult terrain, would not succeed. 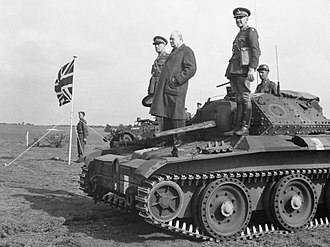 General Alexander gave Montgomery a holding task and transferred the British 7th Armoured Division, the 4th Indian Infantry Division and the 201st Guards Motor Brigade from the Eighth Army to the First Army, joining the British 1st Armoured Division which had been transferred before the main offensive. 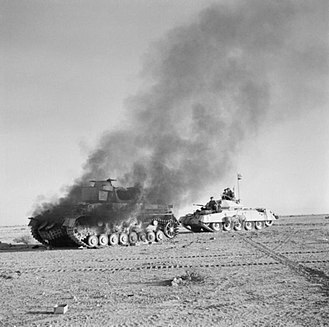 The redeployments were complete by the night of 5 May; Anderson had arranged for a dummy concentration of tanks near Bou Arada on the IX Corps front, to deflect attention from the arrival of the 7th Armoured Division in the Medjez sector and achieved a considerable measure of surprise as to the size of the armoured force when the attack began. The final assault was launched at 3:30 a.m. on 6 May by IX Corps, commanded by Lieutenant-General Brian Horrocks who had taken over from Lieutenant-General John Crocker, who had been wounded. V Corps, under Lieutenant-General Charles Walter Allfrey, had made a preliminary attack on 5 May, to capture high ground and secure the left flank of IX Corps. The 4th British and 4th Indian Divisions, concentrated on a narrow front and supported by heavy artillery concentrations, broke a hole in the defences for the 6th and 7th Armoured divisions to pass through. 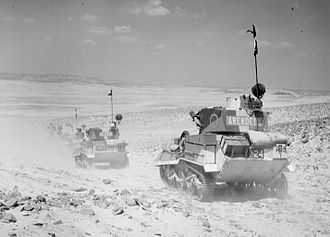 On 7 May, British armour entered Tunis and American infantry from II Corps, which had continued its advance in the north, entered Bizerte. 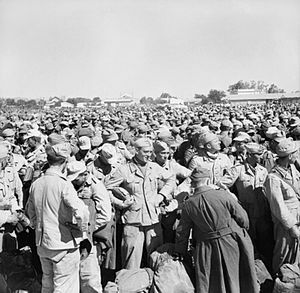 Six days after the fall of Tunis and Bizerte, the last Axis resistance in Africa ended with the surrender of over 230,000 prisoners of war (POWs). Major General Lucian Truscott, commander of the US 3rd Infantry Division and Major General Ernest N. Harmon, commander of the US 1st Armored Division, reported that German resistance in the American sector ceased on 6 May and German troops started surrendering en masse. On 8 May, the 334th Division surrendered to the British forces between Mateur and Tebourba. 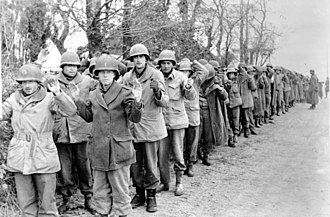 At 10:00 a.m. on 9 May, the US II Corps, now under Major General Omar Bradley, cornered Major-General Gustav von Vaerst and what remained of the 5th Panzer Army, which surrendered before noon. At least 12,000 Germans surrendered in Major-General Fritz Krause's sector (of the initial batch of 25,000 prisoners, fewer than 400 were Italian). Around 22,000 Germans in the mountainous Zaghouan sector also ceased fighting on 11 May and surrendered with their equipment to the Free French. British and Commonwealth forces reported 150,000 Axis POWs taken in the German-held sector from 5 May – 12 June. Major-General Count Theodor von Sponeck, commander of the 90th Light Division, had surrendered unconditionally to the 2nd New Zealand Division, after threatening to fight till the last round. 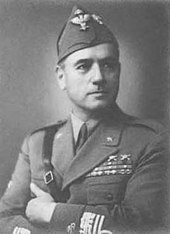 Messe, commander of the 1st Army, held the line north of Takrouna and on 12 May, cabled Comando Supremo vowing to fight on; at 7:55 p.m. that evening, after the German collapse, Mussolini ordered Messe to surrender. Next day, the 1st Army was still holding opposite Enfidaville but the remaining 80,000 men were surrounded; the RAF and artillery continued their bombardment and around noon, the 1st Army surrendered to the Eighth Army. The Axis gamble had only slowed the inevitable and the US defeat at Kasserine may have been paradoxically advantageous. With North Africa in Allied hands, plans quickly turned to the invasion of Sicily and Italy. Joseph Goebbels wrote that it was on the same scale as the defeat in the Battle of Stalingrad; Tunisgrad was coined for the defeat. 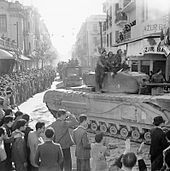 A Victory March was held in Tunis on May 20, 1943, in which units of the First and Eighth Armies and representative detachments of the American and French forces marched past, with bands playing and generals Eisenhower, Alexander and Giraud taking the salute. Allied casualties of 76,020 include the losses incurred by the First Army from 8 November 1942 and the Eighth Army from 9 February 1943. British and Commonwealth losses amounted to 38,360 men; 6,233 were killed, there were 21,528 wounded and 10,599 missing. Free French losses were 19,439; 2,156 killed, 10,276 wounded and 7,007 missing. American losses amounted to 18,221 men; 2,715 killed, 8,978 wounded and 6,528 missing. 849 aircraft were destroyed; from 22–30 November 1942, the RAF flew 1,710 sorties and lost at least 45 aircraft. The USAAF flew 180 sorties and lost at least 7 aeroplanes. From 1–12 December, the RAF flew 2,225 sorties and lost a minimum of 37 aircraft. The USAAF flew 523 sorties and lost another 17 aircraft. From 13–26 December, the RAF flew 1,940 sorties for a loss of at least 20 aeroplanes while the USAAF conducted 720 sorties for a loss of 16 aircraft. From 27 December 1942 – 17 January 1943 the RAF flew 3,160 sorties and lost 38 aircraft while the USAAF flew an estimated 3,200 sorties and lost 36 aeroplanes. From 18 January–13 February the RAF flew 5,000 sorties, excluding those against shipping, for the loss of 34 aircraft while the USAAF flew an estimated 6,250 sorties for the loss of 85 planes. During the remainder of February to 28 March, 156 allied planes were lost. Between 29 March and 21 April, 203 Allied aircraft were destroyed. From 22 April to the end of the campaign, 45 bombers and 110 fighters were lost; the RAF lost 12 bombers and 47 fighters, the USAAF losing 32 bombers and 63 fighters, while the French lost 1 bomber. Axis casualties were from 290,000–362,000 men; the losses are uncertain but it is estimated that the German army lost 8,500 men killed during the campaign while the Italians lost 3,700 men killed; another 40,000–50,000 Axis soldiers were wounded. In the British official history, Playfair wrote that the Allies took 238,243 unwounded prisoners; 101,784 Germans, 89,442 Italians and 47,017 others. In 2004, Atkinson wrote that a quarter of a million men captured is a reasonable estimate. Playfair wrote that G. F. Howe, the American official historian, recorded the capture of 275,000 Axis soldiers, an 18th Army Group calculation of 244,500 prisoners (including 157,000 Germans), that Rommel estimated 130,000 Germans were taken and Arnim estimated 100,000 German and 200,000 Italian prisoners had been taken. The Luftwaffe lost 2,422+ aircraft in the Mediterranean theatre from November 1942 – May 1943 (41 percent of the Luftwaffe). At least 1,045 aircraft were destroyed; from 22–30 November 1942, the Luftwaffe flew 1,084 sorties losing 63 aircraft, including 21 destroyed on the ground. The Regia Aeronautica recorded the loss of 4 aeroplanes. From 1–12 December, the Luftwaffe flew 1,000 sorties and lost 37 aircraft, including nine on the ground, while the Italians recorded the loss of ten more. From 13–26 December, the Luftwaffe flew 1,030 sorties and lost 17 aircraft, while the Italians lost three. From 27 December 1942 – 17 January 1943, the Luftwaffe lost 47 aeroplanes; Regia Aeronautica losses are unknown. From 18 January – 13 February, the Luftwaffe lost another 100 aircraft but Italian losses are unknown. From 14 February to 28 March, 136 German aeroplanes were lost and the Regia Aeronautica lost 22 more. From 29 March – 21 April, 270 Luftwaffe planes were destroyed and 46 "operational aircraft and almost their entire remaining air transport fleet" was lost. From 22 April until the end, the Luftwaffe lost 273 aircraft; 42 bombers, 166 fighters, 52 transport aircraft, 13 Storch observation aircraft and the Italians recorded the loss of 17 aeroplanes; 600+ aircraft were captured by the Allies. ^ 183 lost in the Battle of Kasserine Pass, 6 lost in the Battle of Medenine, 40 lost in the Battle of El Guettar, 16 lost in Operation Oxhead (Operation Ochsenkopf), at least 51 lost in the Battle of the Mareth Line, 32 lost in the Battle of Wadi Akarit, 12 lost in Operation Vulcan and several more lost in minor battles. ^ Mitcham lists the following tank losses with no upper limit and no noted losses to mechanical breakdowns. 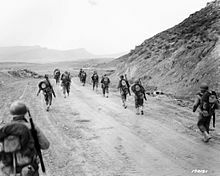 34 (20 German, 14 Italian) lost in the Battle of Kasserine Pass, 55 (40 German, 15 Italian) lost in the Battle of Medenine, 45 (mostly German) lost in the Battle of El Guettar, 71 (all German) lost in Operation Oxhead (Operation Ochsenkopf) and 200+ operational tanks (mostly German) lost in actions after March 9. 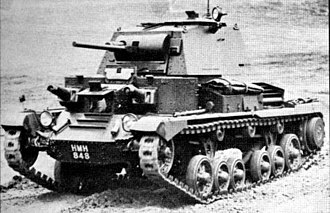 Mitcham also notes that a very large number of tanks were not operational at the time due to previous mechanical issues; for instance, by April 22, only 45% of German tanks were operational, with the rest confined to workshops. Therefore the actual number of tanks lost after March 9 is possibly around 450 rather than 200. ^ After the event, Anderson and Cunningham, the naval commander, expressed the view that without landings east of Algiers, the race for Tunis was lost before it started. 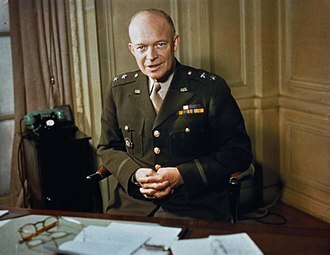 Eisenhower, when accepting the Combined Chiefs' ruling, pointed out that the decision not to land east of Algiers removed the early capture of Tunis "from the realm of the probable to the remotely possible". ^ Mitcham, pp. 56 to 84. ^ Churchill, Winston. "The Hinges of Fate: The Second World War, Volume IV". Houghton Mifflin Company, 1950. Page 697, quoting a telegram from General Alexander on 12 May 1943: "It appears that we have taken over 1,000 guns, of which 180 are 88-mm, 250 tanks and many thousands of motor vehicles, most of which are operational". ^ a b Playfair, p. 239. ^ Playfair et al. 2004, p. 117. ^ Playfair et al. 2004, pp. 117–119. ^ Playfair et al. 2004, p. 171. ^ a b c Anderson 1946, p. 2. ^ Anderson 1946, pp. 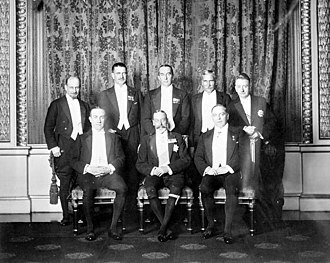 4–6. ^ a b c Anderson 1946, p. 6. ^ Anderson 1946, p. 7. ^ a b c Anderson 1946, p. 8. ^ Anderson 1946, p. 9. ^ a b Playfair, p. 327. ^ a b Anderson 1946, p. 10. ^ a b c Anderson 1946, p. 11. ^ a b c Anderson 1946, p. 12. ^ Anderson 1946, p. 13. ^ Anderson 1946, p. 14. ^ Heefner 2010, p. 101. ^ Delaforce 2008, p. 133. ^ Murray 1995, p. 322. ^ a b c Atkinson 2004, p. 537. ^ Playfair et al. 2004, p. 461. ^ a b c Playfair et al. 2004, p. 460. ^ Atkinson 2004, p. 536. ^ a b Playfair et al. 2004, p. 179. ^ a b Playfair et al. 2004, p. 186. ^ a b Playfair et al. 2004, p. 189. ^ a b Playfair et al. 2004, p. 278. ^ a b Playfair et al. 2004, p. 284. ^ a b Playfair et al. 2004, p. 355. ^ a b Playfair et al. 2004, p. 401. ^ a b Playfair et al. 2004, pp. 460–461. ^ Glantz 1995, p. ch 10. Abramides, John A. (2011). Battle of Sidi Nsir a Personal Account. Royal Hampshire Regiment Journal. Winchester: The Regiment. OCLC 221485318. Archived from the original on 2013-05-09. Anderson, Lt.-General Kenneth (1946). "First Army". 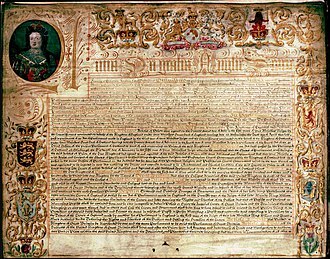 London: London Gazette. ISSN 0374-3721. published in "No. 37779". The London Gazette (Supplement). 5 November 1946. pp. 5449–5464. The Polish Armed Forces in the West refers to the Polish military formations formed to fight alongside the Western Allies against Nazi Germany and its allies during World War II. After the fall of France, in June 1940, the formations were recreated in the United Kingdom, making a large contribution to the war effort, the Polish Armed Forces in the West was composed of army and naval forces. The Poles soon became shock troops in Allied service, most notably in the Battle of Monte Cassino, during the Italian Campaign, where the Polish flag was raised on the ruined abbey on May 18,1944. The Polish Armed Forces in the West were finally disbanded, after the war, in 1947, after Polands defeat in September-October 1939, the Polish government-in-exile quickly organized in France a new fighting force originally of about 80,000 men. Their units were subordinate to the French Army, in early 1940 a Polish Independent Highland Brigade took part in the Battles of Narvik in Norway. A Polish Independent Carpathian Brigade was formed in the French Mandate of Syria, the Polish Air Force in France comprised 86 aircraft in four squadrons, one and a half of the squadrons being fully operational while the rest were in various stages of training. 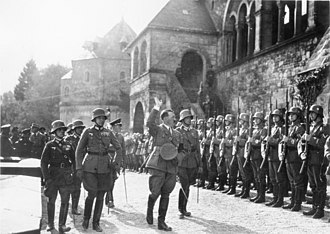 Two Polish divisions took part in the defence of France, while a Polish motorized brigade, at the capitulation of France, General Władysław Sikorski was able to evacuate many Polish troops—probably over 20, 000—to the United Kingdom. I Corps was under the command of Scottish Command of the British Army. While in this area the Corps was reorganised and expanded, Polish fliers had an important role in the Battle of Britain. From these a 75, 000-strong army was formed in the Soviet Union under General Władysław Anders and this army, successively gathered in Bouzoulouk, was ferried from Krasnovodsk across the Caspian Sea to the Middle East where Polish II Corps was formed. By the end of the Second World War, they were 195,000 strong, after the German Instrument of Surrender,1945, Polish troops took part in occupation duties in the Western Allied Occupation Zones in Germany. A Polish town was created, it was first named Lwow, Polish troops were incorporated into the 1945 top secret contingency plan, Operation Unthinkable, the hypothetical attack on the Soviet Union that would have led to an independent Poland.